Giriş ve amaç: Adenoid hipertrofisi ve uyku bozukluğu olan solunum çocukluk çağının sık karşılaşılan hastalıklarındandır. Oral kortikosteroidler antiinflamatuar ve lenfolitik etkileri sayesinde üst havayolu obstrüksiyonuna yol açan hastalıklarda kullanılmaktadır. Adenoid hipertrofi tedavisinde nazal kortikosteroidler yaygın kullanılmasına rağmen oral kortikosteriodlerin adenoid dokusu üzerine olan etkileri hakkında çok az bilgi bulunmaktadır. Adenoid hipertrofisinin inflamatuar zeminle ilişkisine bağlı olarak oral kortikosteroid tedavisinin adenoid hipertrofi tedavisinde faydalı olabileceği düşüncesi ile herhangi bir nedenle oral kortikosteroid alan hastaların adenoid dokusu üzerine olan etkilerini araştırdık. Metod: Prospektif gözlemsel çalışma planlandı. Toplam 51 hasta (2 ile 11 yaş arasında) çalışmaya dahil edildi. Her hastaya (1 mg/ kg) 3 günlük oral kortikosteroid tedavisi verildi. Tedavi öncesinde ve sonrasında hastaların ailelerine obstrüktif uyku apnesi anketi (OSA-18) değerlendirmesi ve hastalara transnazal endoskopik değerlendirme yapıldı. Ayrıca her hastanın anamnezi, fizik muayenesi ve kan testleri değerlendirildi. Tedavi öncesi ve sonrasında OSA-18 anket sonuçları ve adenoid büyüklüğü karşılaştırmaları yapıldı. Sonuç: OSA-18 skorunda ve adenoid büyüklüklerinde tedavi sonrasında anlamlı azalma görüldü (p<0,001). Tedavi sonrasında herhangi bir komplikasyon görülmedi. Sonuç: Yaptığımız çalışmada kısa dönem oral kortikosteroid tedavisi sonrasında adenoid büyüklüğünde küçülme ve OSA-18 skorlarında düzelme gördük. Ancak 3 günlük oral kortikosteroid kullanımının uzun dönem tedavi etkinlik sonuçları ve geç dönem sistemik etkileri bilinmeden rutin tedavi olarak kullanılmaması gerektiğini düşünüyoruz. The pharyngeal tonsil (adenoid) is a mass of lymphoid tissue in our body located above the tonsils in the roof of the nasopharynx. This lymphoid tissue is inclined to substantial hypertrophy under adverse conditions, such as chronic and recurrent infections of the upper respiratory tract or allergies (or both). [1,2] Adenoidal hypertrophy is generally regarded a common status of childhood and presents one of the most common indications for surgery in children. Several forms of corticosteroids are the first lines in the treatment of allergic diseases (e.g. urticaria, laryngitis, asthma, dermatitis). In addition, a topical nasal corticosteroid spray is effective in the treatment for allergic rhinitis, which is also associated with sleep disorders through nasal blockage, hypertrophy of the tonsils and adenoids and face deformities. Oral corticosteroids have been used to treat upper airway blockages caused by adenotonsillar hypertrophy in infectious mononucleosis through their anti-inflammatory and lympholytic impacts. Similarly, some studies have reported that oral corticosteroids can be used for otitis media with effusion because of improved middle ear drainage by reducing edema or by decreasing the volume of the lymphoid tissue near the eustachian tube at the nasopharynx. However, there are rare results that present effects of oral corticosteroid in adenoid hypertrophy and related diseases. This study was aimed to evaluate the effect of short-term oral corticosteroid treatment on adenoid hypertrophy in patients receiving oral corticosteroids for any other reasons, using a fiberoptic nasal endoscopy and parental questionnaire (obstructive sleep apnea-18, OSA-18) on treatment outcome. The study was conducted in our Departments of Otorhinolaryngology and Pediatrics between January 2013 and August 2013. This prospective observational study included 51 (34 males, 17 females) children between ages 2 and 11 who were decided to receive oral corticosteroid by the pediatrics clinic due to urticaria, laryngitis or asthma based on the following inclusion criteria: 1) history of habitual snoring for the last 3 months or longer and 2) adenoid hypertrophy diagnosed with an endoscopic examination by otolaryngologists. Children were excluded from the study if they met any of the following exclusion criteria: 1) presence of symptoms of acute respiratory infection; 2) use of nasal or systemic corticosteroid or antibiotics within 4 weeks prior to the study; 3) prior tonsil or adenoid surgery; and 4) a history of craniofacial, neuromuscular, or genetic disorders. 5) presence of grade 3 or grade 4 tonsillar hypertrophy. Informed consent for participation in this study was obtained from the parent or legal guardian of each child inscribed. Initial evaluations of each patient upon entering the study included the following: history and physical examination, parental questionnaire (OSA-18), blood test, and adenoid size measurement. Allergic diseases were diagnosed in case patients complaining of typical symptoms showed positive diagnostic results. We assessed blood tests (WBC, Hb, etc.) to detect the presence of any infection. Adenoid size measurements were evaluated transnasally with a "0" degree 2.7 rigid nasal endoscope (Storz, Tuttlingen, Germany) according to the classification described by percentage (%). Tonsil sizes were graded in physical examination. All patients received a 3-day course of a single oral corticosteroid treatment (1 mg/kg). After 1 month, all patients were reassessed to evaluate the adenoid size and parental questionnaire. The first result was measured with the OSA-18 survey (Table 1), a trusted sensitive quality of life (QOL) measure for children with changing levels of sleep disordered breathing (SDB). The OSA-18 has been previously shown to contain acceptable test trustworthiness and internal expediency. The survey includes 18 items classified into 5 parts: sleep disturbance (4 items), physical suffering (4 items), emotional distress (3 items), daytime problems (3 items), and caregiver concerns (4 items). Items are marked on a 7-point ordinal scale (Table 1). After the parental questionnaire, OSA-18, adenoid size of each patient were evaluated using the "0" degrees 2.7 rigid nasal endoscope transnasally by two otolaryngologists who were blinded to the status of the patients. Adenoid size causing airway obstruction was classified in four grades according to adenoid size occupying percentage (%) of the choanal area by the endoscopic images. According to the grading, grade 1 0-25%, grade 2 25-50%, grade 3 50-75%, grade 4 75-100%. All patients' tonsil sizes were evaluated in physical examination; grade 1, tonsils are located at tonsillar fossa and seen barely behind anterior pillar. grade 2, tonsils are seen easily behind anterior pillars. grade 3, tonsils are prolonged three-quarters of the way to the midline. grade 4, tonsils obstruct airway completely.5 Patients with grade 3 and 4 tonsillar hypertrophy were considered severe and excluded in the study because of causing sleep disordered breathing. The research project was approved by the Research Ethics Committee. Continuous variables were tested for normal distribution by the Kolmogorov-Smirnov test. The variables are expressed as means ± standard deviations. The Wilcoxon signed rank test was used for comparisons of parameters before and after treatment. The Spearman correlation coefficient was examined to evaluate the degree of association between the changes in OSA-18 scores and in adenoid size. A two-tailed p value <0.05 was considered significant, and the SPSS statistical package for Windows version 15.0 (SPSS Inc., Chicago, IL, USA) was used for the statistical analysis. Table 2 summarizes the demographic data including the patient's age, gender and history of disease. All 51 children completed the 3-day course of a single oral corticosteroid (1mg/kg per day) treatment. There was no side effect of the corticosteroid usage during the follow up period in our study. The changes in adenoid sizes and OSA-18 survey scores after treatment are shown in Table 3. Sleep disturbance and physical suffering were the highest rated fields, followed by caregiver concerns, daytime problems, and emotional distress. There was a significant reduction in the score of the sleep disturbance field (P<0.001) and physical symptom field (P<0.001) after treatment (Figure 1). The mean adenoid size occupying percentage of the choanal area was 57.4±14.4% before treatment and 39.8±15.8% after treatment. The mean adenoid grade was 2.73±0.64 before treatment and 2.25±0.60 after treatment. There was a statistically significant difference (P<0.001) between before and after treatment values in these results (Figure 2). There was a variable correlation between the changes in adenoid size and improvements in OSA-18 parameters (Table 4). There was statistically significant correlation between the change adenoid size and sleep disturbance, physical suffering, and emotional distress results. Although there were improvements in daytime function and caregiver concern results, correlation between the change in adenoid size was not statistically significant (Table 4). Büyütmek İçin Tıklayın Fig 1: Comparison of symptom score between before and after 3 days course of oral corticosteroid treatment. 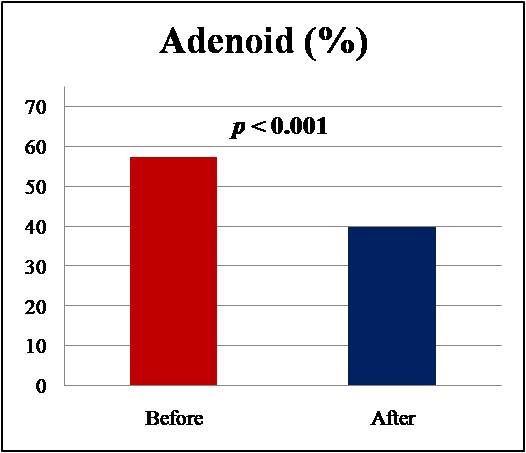 Büyütmek İçin Tıklayın Fig 2: Comparison of adenoid size(%) between before and after 3 days course of oral corticosteroid treatment. In this prospective study we observed significant improvement in both OSA-18 survey score and adenoid size in children who were decided to receive oral corticosteroid by the pediatrics clinic due to urticaria, laryngitis, or asthma with SDB and adenoid hypertrophy after a 3-day trial treatment. 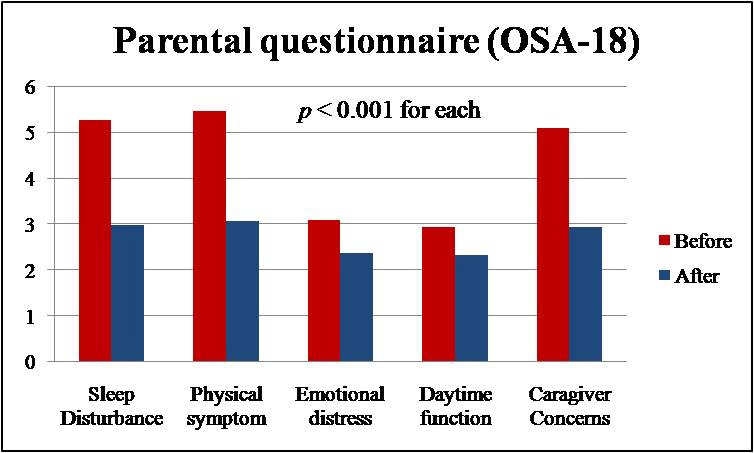 Among the OSA-18 survey's main items; sleep disturbance, physical suffering and emotional distress results were improved significantly while daytime problems and caregiver concerns results were also improved but not statistically significantly. Any oral corticosteroid form was accepted among many steroid products. Systemic corticosteroid dose is 1 mg/kg per day to treat acute asthmatic attacks, urticaria, laryngitis, resolute middle ear effusions, and other allergic diseases; higher doses are occasionally used to reduce adenotonsillar hypertrophy during mononucleosis or to improve laryngeal inflammation. All our patients had a complaint of diseases as acute asthmatic attacks, urticaria and laryngitis therefore they received 1 mg/kg oral corticosteroid per day. There are many side effects of corticosteroids in children as slowing of growth, reduced ability to fight with infections, stomach ulcers, high blood pressure, increased appetite, weight gain, bone thinning etc. But almost all of these side effects occur in long-term treatments. In our study the treatment duration was 3 days. It is not expected to cause an extended depression of the hypothalamic-pituitary adrenal relation in short-term corticosteroid usage. In our study with short term follow up there was no side effect of corticosteroid usage. There are many studies evaluating intranasal steroid effect on adenoid size. Mainly these studies showed reduction of adenoid size with intranasal steroid. Berlucchi et al. assessed the efficacy of an intranasal steroid (mometasone furonate) in the treatment of adenoid hypertrophy after a 40-day treatment and 77.7% of children had symptomatic healing. In other study, Brouilette et al. evaluated the effect of fluticasone propionate treatment for pediatric obstructive sleep apnea syndrome (OSAS). They used intranasal spray versus a placebo for 25 children with OSAS. In this study, 69% of patients showed improvements in symptom score. Cengel and Akyol in 2006 reported a study on the change in adenoid size after a 6-week course of an intranasal mometasone furoate treatment, where 67.2% of enrolled patients showed reductions in adenoid size after treatment. Another study in 1995 reported a study of nasal beclomethasone for adenoid hypertrophy. After an 8-week treatment, the adenoid size mean reduction in adenoid/choana ratio was 29%. In our study, patients showed decreased results in mean adenoid size occupying percentage of the choanal area from 57.4±14.4% to 39.8±15.8% (p<0.001) and in mean adenoid grade from 2.73±0.64 to 2.25 ± 0.60 (p<0.001) after a 3-day course of oral corticosteroid (1 mg/kg). We have used the OSA-18 survey for evaluating the efficacy of short-term oral corticosteroid in symptomatic healing. The OSA-18 was used in several studies[26,27] as a determiner of the efficacy of a treatment and it was reported as convenient and easily practicable. In our study, there is a significant improvement in OSA-18 scores after oral corticosteroid. Several methods (x-ray graphs, nasal endoscopy, and digital palpation) have been used to evaluate adenoid tissue. However, there is not much agreement on the best way to evaluate the size and location of adenoid tissue in the preoperative period. X-ray graphs have some side effects, such as imperfect images of anatomic structures and radiation. [11,15] Unstable soft anatomic tissues may be affected with positional changes and breathing, so views of x-ray graphs may be incorrect. Nasal endoscopy is a safe, reliable, and simply tolerated diagnostic method if suitable endoscopes are used under proper conditions. It provides impartial and optimal results. For this reason, we used nasal endoscopy to assess adenoid tissue size. Based on the nasal endoscopy we used two classification methods: adenoid size occupying percentage (%) of the choanal area and grading method. The mechanism of the reduction in adenoid tissue size is unclear. Adenoid tissue had ample glucocorticoid receptors. Glucocorticoid receptor mRNA expression was increased in OSA-derived adenoid and tonsil tissues in recurrent throat infections. Therefore, these children may reply properly to treatment with steroids. Mechanisms for the efficacy of steroids on the decrease in nasal airway obstruction include lympholytic effects through the glucocorticoid receptors that cause a direct reduction in adenoid size; a decrease in adenoid inflammation through the anti-inflammatory effect of steroids. In our study, oral corticosteroid influenced the degree of change in adenoid size and OSA-18 score. We supposed that improvements of symptomatic problems in patients are due not only to the decreased adenoid size but also to the increased nasal passage clearance. There are some limitations to this study. We could not have a control group. All our patients should have to use oral corticosteroid because of their diseases like laryngitis, asthma, urticaria. So our study design was not suitable for control group with placebo. The other limitation is the lack of long-term follow-up. If we had conducted long-term follow-up, we could have had a clearer decision about the efficacy and long term side effects of oral corticosteroid. We consider that without knowing the long term results of oral corticosteroid, it shouldn't be used as a routine treatment for adenoid hypertrophy and SDB. The other limitation is the lack of polysomnography (PSG). PSG is more valuable to evaluate the severity of SDB. [29,30] PSG is a costly diagnostic method and has a difficulty to apply to pediatric patients. For this reason we used OSA- 18 survey to evaluate the severity of SDB. We observed reduction in adenoid size and symptomatic healing of SDB with 3-day course of oral corticosteroid. Without knowing the long term efficiency and systemic effect results of 3-day oral corticosteroid, it shouldnt be used as a routine treatment for adenoid hypertrophy and SDB. 4) Kenna MA. Tonsils and adenoids. In: Behrman RE, Liegman RM, Jenson HB, eds. Nelson Textbook of Pediatrics. Philadelphia, PA: W.B. Saunders; 2000:1267-8. 16) Haynes R, Murad F. The adrenocorticosteroid hormones:adrenocortical steroid and their synthetic analog. In: Goodman LS, Gilman A, eds. The Pharmacological Basis of Therapeutics. New York: Macmillan; 1985:603-20.